Agricultural Bank of China is on course for a record 22.1 billion US dollar initial public offering after pricing its Hong Kong shares, demonstrating continued investor confidence in China. The bank on Friday priced its shares in the Hong Kong portion of the IPO at 3.20 Hong Kong dollars (41 US cents). 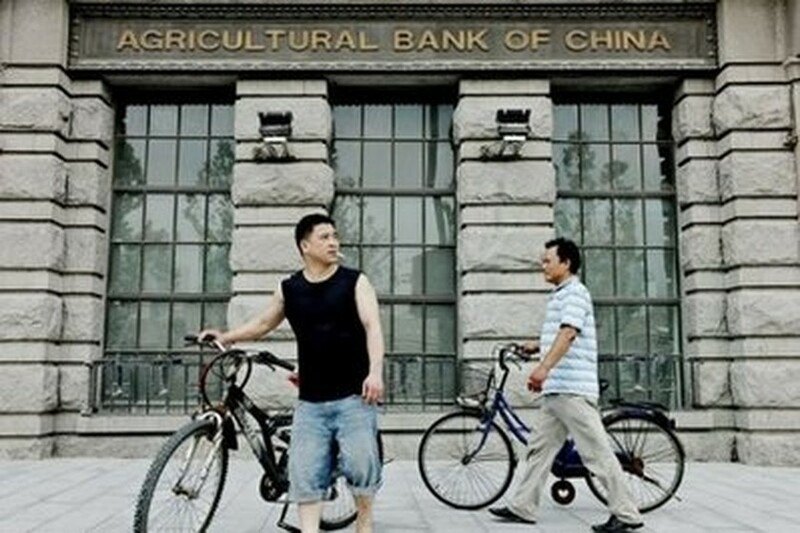 Two men push their bicycles past a Shanghai branch of the Agricultural Bank of China on June 30, 2010. Assuming an over-allotment option is exercised, the dual Hong Kong-Shanghai listing should outpace Industrial & Commercial Bank of China's 21.9 billion dollar offering in 2006. "The offer price for the global offering has been determined at 3.20 Hong Kong dollars per H share," the bank said in a statement to the Hong Kong stock exchange. AgBank -- the last of China's Big Four banks to list its shares -- said on Wednesday it had raised 68.5 billion yuan (10.1 billion US dollars) from the Shanghai portion of its monster IPO. AgBank's Hong Kong sale drew almost a dozen heavyweight investors, including Qatar's sovereign investment fund, British bank Standard Chartered and Hong Kong's richest tycoon Li Ka-shing. Further details about the offering, including whether it has set a new record, will likely not be confirmed until next week, a bank spokesman said. "If you need any evidence where the future of capital markets" lies, "it is the Agricultural Bank of China set to announce a record amount raised in an IPO," the Royal Bank of Scotland said in a research note earlier. "European banks could only dream of raising this much capital at the moment." AgBank in recent weeks scaled back its original 30-billion-dollar IPO target amid market volatility tied to concerns about the global economy and questions about a balance sheet dented by bad loans. Some analysts consider the rural lender to be the weakest of China's big banks owing mainly to its bad-loan burden and a mandate to loan money to poor farmers instead of focusing on higher-profit areas. But AgBank chairman Xiang Junbo said last month the company was poised to capitalise on Chinese government efforts to boost economic growth in the country's centre and west, which have missed out on the export-driven boom enjoyed by coastal regions. "The county area business will be one of our key profit drivers," Xiang said. AgBank "is well positioned to capitalise on China's next wave of growth." The lender's stock is set to begin trading in Shanghai on July 15, and in Hong Kong a day later. AgBank is the only company set to debut next week either on the Shanghai stock exchange or its counterpart in the southern industrial boomtown Shenzhen, Qiu Yanyin, a Shanghai-based analyst with TX Investment Consulting Co., told AFP. "There are no new listings next week. It's hard to speculate whether it's the regulators' intention, but I think it's not something unique to China," Qiu added. "Firms may not want their debut to be overshadowed by a big company." Jonathan Siu, analyst at Core Pacific-Yamaichi in Hong Kong, said he expected a lukewarm trading debut for AgBank in Hong Kong. "I don't expect it would stage an impressive debut given recently weak trading sentiment for new listings, but there's room for around five (percent) rise on its first trading day based on its offer price," he told Dow Jones Newswires. AgBank will also offer Japanese investors a portion of its shares ahead of its listing, Nomura Securities, one of the two lead underwriters in Japan, said this week. Citing an unnamed source, the Nikkei business daily reported that AgBank hoped to raise up to 50 billion yen (570 million dollars) in Japan, where many wealthy investors are also following the growth outlook of the Chinese market. The lender, which was set up in 1951, two years after Mao Zedong's communist revolution in China, said it had booked a profit last year of 65 billion yuan, up from 51.45 billion yuan in 2008.